Matty has a restaurant, but he can’t afford the costs of a website so he decides to register at a website where he can sell products and give a small percentage to the site owner. Login with your Administrator account and go to Users > Add New. On the Add New User page, fill out the fields as desired. This will be your Product Vendor’s account. It’s important that you select the new user’s Role from the drop down and set that to Vendor Admin. This will give your Product Vendor the ability to administrate their products. Be sure to send the newly created Product Vendor their credentials. Go to Products > Vendors and create a new vendor as shown in the screenshots below. Make sure that you select the Product Vendor’s email address in the Vendor Admins field. When you click in this field you will be able to search for users. Adding the Product Vendor to the Vendor Admins field will allow the user to administrate their products. The only fields that are required are Name, Enable Bookings Features, and Vendor Admins. If you do not enable Bookings feature, then your Vendors will not be able to create Bookable Products. The rest of the fields are either used for display on the Vendor’s Profile page, or pertain to commission. You can set the commission here or on the product as the Vendor Admin. The new Product Vendor will be able to login and add products. You can login as the Product Vendor to follow the next set of steps. product has Bookings duration set to Fixed blocks of 1 hour. Setting the All dates are… to not-available by default is often the best approach when creating complex availability rules. It’s easier to add what is available, then to add what is and what is not. The buffer period we set here allows our trainers time to travel between locations. Product has Max bookings per block set to 18. Product has Require a buffer period of 1 hours between bookings. Product has All dates are… not-available by default. The rules for this Bookable Products are set as follows. This rule states that Saturday and Sundays (weekends) are not bookable. This rule states that December 25th 2018 is not bookable. This rule states that January 1st 2019 is not bookable. We would like to charge different rates for children and adults. We want to require that at least one person books and that a maximum amount of 18 persons can book. We are going to multiply all the costs of this booking by the amount of persons, as well as count bookings as person. What this does is allow us to tie a person to a booking. Remember that we set the Max bookings per block to 18. Since each person counts as a booking, that means that each person selected will take away one spot from the booking. Lastly we set the name of the person type, how much that person type costs as well as require that at least 1 Adult books. We don’t want just children booking. Product has Min persons set to 1. Product has Max persons set to 18. Product has Multiply all costs by person count enabled. 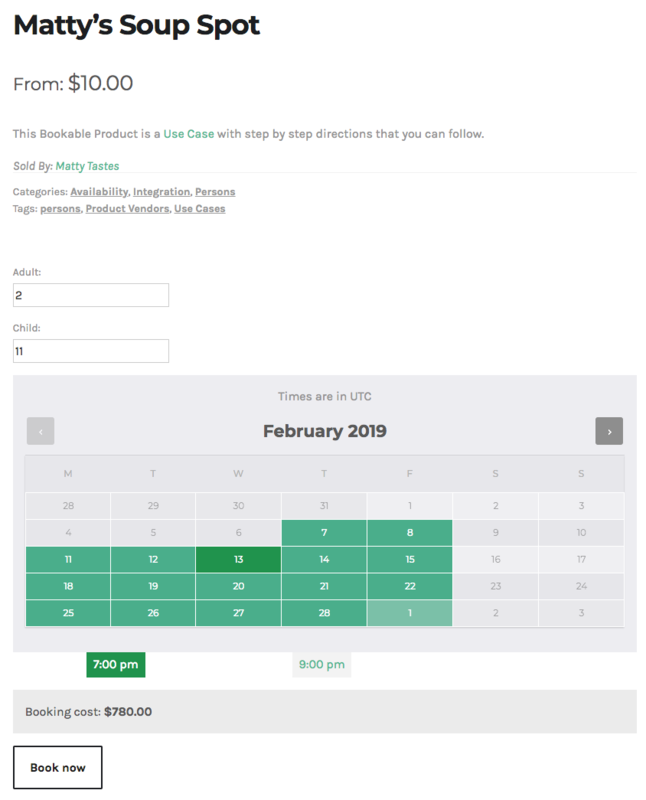 Product has Count persons as bookings enabled. Product has Enable persons type enabled.